September 11, 2018 at 7:15 pm. Mississippi State coach Joe Moorhead has started different quarterbacks during his initial two games with the 16th-ranked Bulldogs. He’s looking for more efficiency. Senior Nick Fitzgerald, of course, is the main man moving forward. 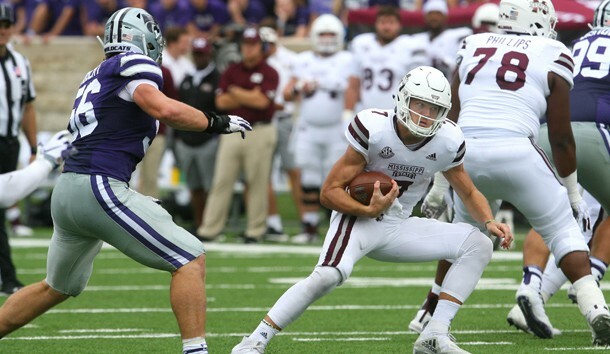 Coming off a broken right ankle suffered on Thanksgiving — and then a one-game suspension to start this season — he showed a bit of rust last week in a 31-10 win at Kansas State. The ankle was fine — he rushed for 159 yards on 19 carries — but the 6-foot-5, 230-pounder hit on just 11 of 27 passes for 154 yards, with two touchdowns and an interception. Fitzgerald’s Game 1 replacement, Keytaon Thompson, completed only 13 of 31 passes against Stephen F. Austin, although those connections went for 364 yards and five touchdowns. “A lot of things go into completion percentage — protection, the route, the read and the throw,” Moorhead said. Due in part to Mississippi State’s deficiencies through the air, the Bulldogs have rushed 76 times and attempted 61 passes. “We’re a little bit run-heavy right now, but we’d like to be as close to 50-50 as we can,” Moorhead said. Louisiana’s victory over Grambling marked the head coaching debut of Billy Napier. He spent five seasons at Alabama, including four (2013-16) as the wide receivers coach for Nick Saban. Napier was the offensive coordinator at Arizona State in 2017. Napier replaced Mark Hudspeth, who is now Mississippi State’s associate head coach/tight ends coach. With Napier’s time with the Crimson Tide and previous stints at Clemson, he knows what big-boy football looks like. “When the music is playing and the lights are flashing and you’re walking down the aisle … you want to be ready to compete,” Napier said Monday. Sophomore Trey Ragas, who led the Ragin’ Cajuns in rushing last season with 813 yards, went for 142 yards on the ground in the opener. The Cajuns ran for 336 yards while playing two quarterbacks — Andre Nunez (19 of 22 for 184 yards and two touchdowns) and Levi Lewis (4 of 8 for 57 yards and two TDs). Mississippi State’s defense is led by end Montez Sweat (rated the No. 32 prospect in the nation by NFLDraftScout.com) and defensive tackle Jeffrey Simmons, a top 100 prospect. They have combined for 38.5 tackles for loss in the past 15 games. The Bulldogs are 3-0 all-time against Louisiana but the teams haven’t played since 1987. Mississippi State will be looking to run to win. The Bulldogs have rushed for more than 250 yards in 13 of their past 20 games. They were 8-1 last season when eclipsing 250 on the ground. That doesn’t mean Moorhead isn’t looking for better production from Fitzgerald — a potential first-round pick — in the passing game.